Home / Fish / A Masked Butter Hamlet Hybrid from Florida? Hypoplectrus is diverse genus from the grouper family that has somewhere around 18 species. 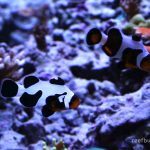 These fishes (known commonly as “hamlets”) are famous among evolutionary biologists for their complex evolutionary history, driven strongly by sexual selection. In a given region, there may be up to a dozen closely related species, all nearly indistinguishable in their genetics, that tend to breed only among their own kind. 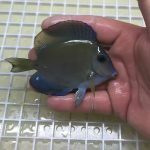 Hybrids are known, but they tend to be rather uncommon; however, the fish seen here, collected by Dynasty Marine back in February from near Marathon, Florida, may be one of these rare finds. Uploaded by ScubaDoughs on 2016-06-04. The dark pectoral fin margin and the distinctive black mask beneath the eye are both highly diagnostic traits for the Masked Hamlet (H. providencianus). 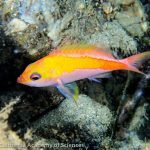 This beautiful fish is found throughout the central portion of the Caribbean, from the Bahamas and Puerto Rico in the east to the Yucatan Peninsula and Panama in the west. It has also been recorded from the Florida Keys (Jeffrey et al 2001), though it is seemingly quite rare here. 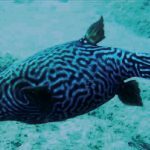 One of the rarest fish you can find in the Cayman Islands. In 2 and a half years, we’ve only seen one of these – the Masked Hamlet. Other Hamlets are common, but the Masked is never seen, apart from in this video taken on my 40th birthday when it appeared as a special surprise present on my birthday dive. 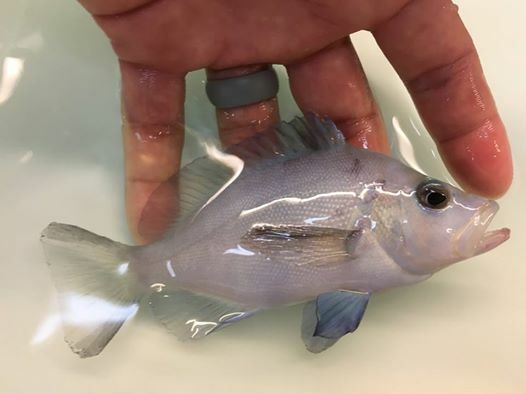 But there is also reason to doubt that this is our fish: 1) The snout has a black marking and paired blue lines not seen in the Masked Hamlet. 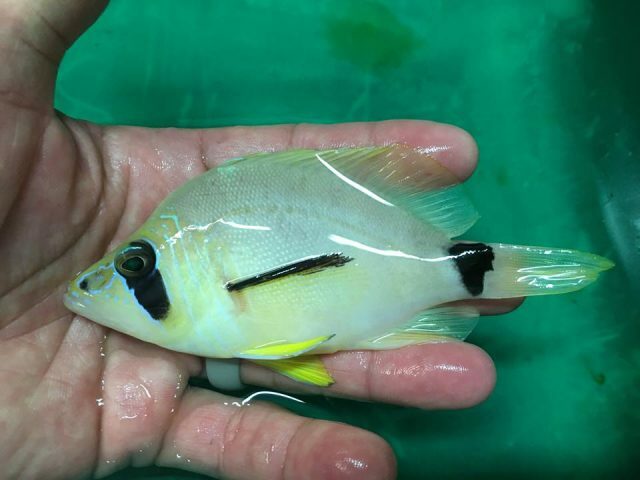 2) The caudal fin is entirely yellow, rather than marginally or entirely black. 3) The pelvic fins are bright yellow, and not blue-grey. These three traits are, however, all found in one of the most abundant hamlets of South Florida—the Butter Hamlet (H. unicolor). Butter Hamlet. Credit: Jon B. So, is this a hybrid? 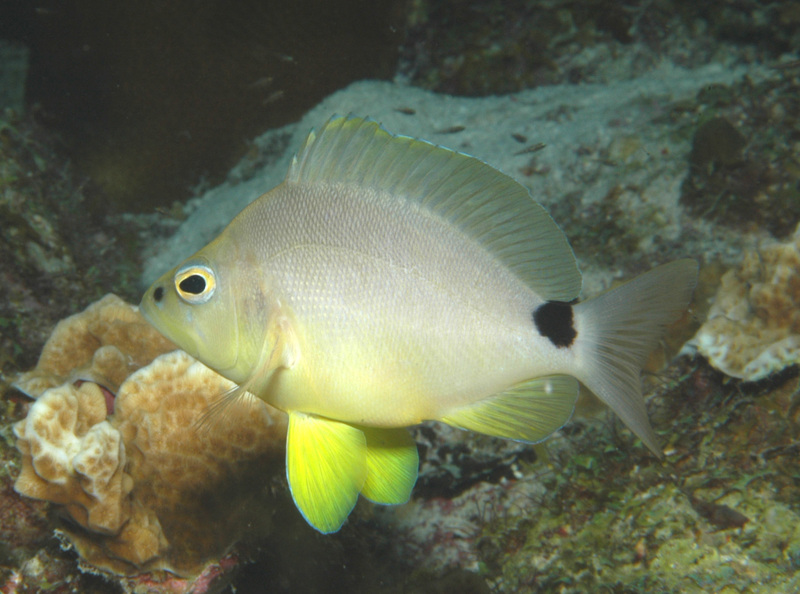 One could make the argument that this might be an immature Masked Hamlet, as they do indeed have yellow fins, but, importantly, they lack the facial markings seen in this specimen. And, of course, this isn’t a Butter Hamlet either, as that species wouldn’t have the dark markings seen here. So it seems Dynasty Marine has stumbled upon a great discovery with what might be the first documented Masked Butter Hamlet!